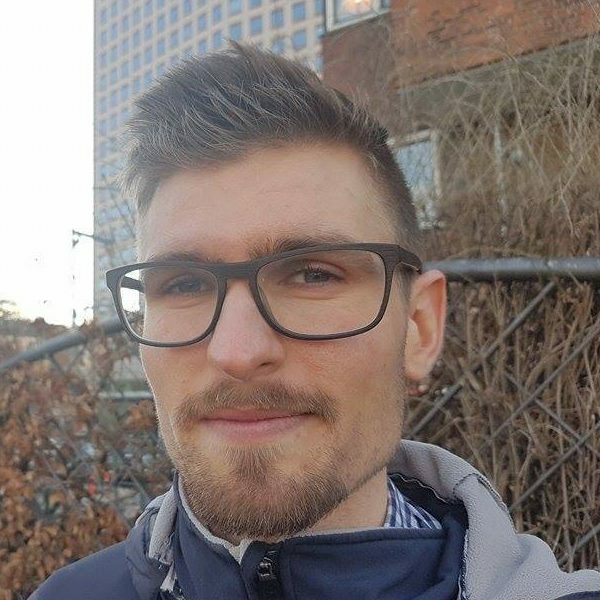 The following article was written by guest blogger Magnus Vinding. The opinions expressed in this article do not necessarily reflect the views of Sentience Politics. Focusing our advocacy on antispeciesism may be our best bet. In short, antispeciesist advocacy looks very promising because it encompasses all nonhuman animals and implies great obligations toward them, and also because people may be especially receptive to such advocacy. More than that, antispeciesism is also likely to remain relevant for a long time, which makes it seem uniquely robust when we consider things from a very long-term perspective. Antispeciesism addresses all the ways in which we discriminate against nonhuman animals, not just select sites of that discrimination, like circuses or food farms. Unlike more common approaches to animal advocacy, it demands that we take all forms of suffering endured by nonhuman animals into consideration. Campaigns against fur farming, for instance, do not also cover the suffering and death involved in other forms of speciesist exploitation, such as the egg and dairy industries. Veganism, on the other hand, is much broader, in that it rejects all directly human-caused animal suffering. Advocating for the interests of comparatively few beings when we could advocate for the interests of many more with the same time and resources is likely a lost opportunity. But even veganism is not as broad as antispeciesism, since it says nothing about the vast majority of sentient beings on the planet: animals who live in nature. Wild animals also suffer, and should not be granted less consideration simply because their suffering is not our fault. 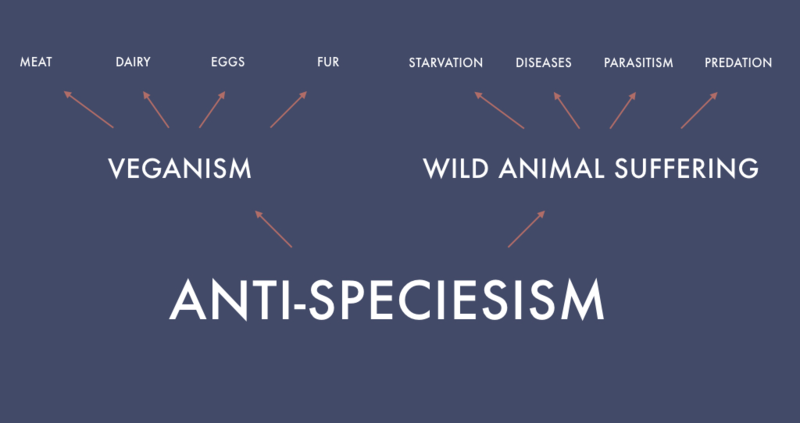 Antispeciesism implies veganism – i.e. that we “exclude, as far as is possible and practicable, all forms of exploitation of, and cruelty to, animals for food, clothing or any other purpose” – but unlike veganism it also requires us to give serious consideration to nonhuman animals who are harmed in nature. Antispeciesism implies that we should help wild animals in need, just as we should help humans suffering from starvation or disease that we didn’t cause. Unfortunately, nonhuman animals are often harmed in nature, and often do succumb to starvation and thirst. Fortunately, there is much we can do to work for a future with fewer harms to them. Even if we expect people to be more receptive to messaging that is narrower in focus and easier to agree with, the all-encompassing nature of antispeciesist advocacy could mean it has the greater expected value overall. But are people really less receptive to such advocacy anyways? The concept of speciesism may seem abstract and advanced, and may strike us as something only committed animal rights advocates know of and understand. Yet there are reasons to think that this gut intuition is wrong. This is significant: a majority of attendees accepted the arguments against speciesism. And perhaps we should not be that surprised. Most people understand the concept of discrimination already, and speciesism is just another form of discrimination. The fact that many people are already familiar with the concept of discrimination and agree that it is not justified suggests that there might be a template upon which speciesism can easily be argued against. This could be part of the explanation for why most of Horta’s attendees accepted the arguments against speciesism. Another reason might be that the arguments against speciesism are exceptionally strong and hard to argue with, and as students, Horta’s attendees may have been able to approach the topic with an open and rational mindset that made them particularly ready to agree with such arguments. If this difference in effectiveness between vegan and antispeciesist messaging is similar in the broader public, the implications for advocacy are profound: even if one’s goal is only to promote veganism, the best way to do so might be to talk about speciesism, rather than, or at least before, talking about veganism. That talking about veganism straight away seems to have made the students less receptive not only to veganism itself but also to arguments against speciesism is also worth taking note of. More thorough replication of Horta’s findings, on larger, more varied populations would significantly increase our confidence in the conclusion that antispeciesist advocacy is superior to vegan advocacy for creating antispeciesists, as well as vegans. Until then, Horta’s reported findings do at least suggest that people can accept arguments against speciesism, and that antispeciesism might be among the animal rights memes that people are most receptive to. Is vegan advocacy costly to wild animals? This is good news for animals and their advocates, given that the vast majority of nonhuman animals live in nature. Helping animals in the wild – for instance through vaccinations and cures for diseases – may be among the most effective ways in which we can help nonhuman animals. Vegan advocacy excludes consideration of their interests, but antispeciesist advocacy does not. This means that not only might it be costly to focus mainly on veganism in the interest of spreading antispeciesism or veganism itself (compared to focusing mainly on speciesism and then raising the issue of veganism), but it might also be costly with respect to the goal of helping animals in nature. It’s possible that talking about veganism rather than speciesism makes it significantly harder to bring about interventions that could help nonhuman animals. Compared to veganism, antispeciesism is also much harder to confuse with environmentalism, supporters of which often recommend overtly speciesist interventions such as the mass killing of beings in the name of “healthy ecosystems” and biodiversity. This lack of potential for confusion is another strong reason in favor of antispeciesist advocacy. Antispeciesist advocacy is also much more neglected than vegan advocacy. Veganism is rising, and there are considerable incentives entirely separate from concern for animals to move away from the production of animal “products”. In economic terms, it is inefficient to sustain an animal in order to use her flesh and skin rather than to grow meat and other animal-derived products directly, or replace them with plant-based alternatives. Similarly strong incentives exist in the realm of public health, which animal agriculture threatens by increasing the risks of zoonotic diseases, antibiotic resistant bacteria like MRSA, and cardiovascular disease. These incentives, none of which have anything to do with concern for nonhuman animals per se, could well be pushing humanity toward veganism more powerfully than anything else. While veganism likely has a promising future, the future of antispeciesism seems much less clear and less promising still, and has far fewer people working to promote it. This suggests that our own limited resources might be much better spent promoting the latter. When thinking about how to build a better tomorrow, we should also consider the following tomorrows, and if we have a virtually vegan world a century from now due to the incentives mentioned above, the world will likely still be speciesist in many other respects. So in addition to the appeal antispeciesist advocacy has for the nonhuman animals whom humans are actively harming now, the explicitly antispeciesist approach is important for the sake of nonhuman animals in the future, including those whom we may not be hurting, but have the ability to help. Working towards a less speciesist future could both help close down the slaughterhouses, and help many animals long after. Additionally, the spread of antispeciesism might also be a useful stepping stone toward concern for sentient beings of nonanimal kinds. Unfortunately, there is a risk that new kinds of sentient beings could emerge in the future – for instance biologically engineered brains – and become the victims of a whole new kind of factory farming. Just like concern for humans who face discrimination can provide useful support today when the case against speciesism is made, antispeciesism could well be similarly generalizable and provide such support in the case against new forms of discrimination. A final point in favor of antispeciesist advocacy over vegan advocacy is that the message of the former is clearly ethico-political in nature, and therefore does not risk being confused with an amoral consumerist preference or fad, as veganism often is. The core of antispeciesism is clear, easy to communicate, and much follows from it in terms of the practical implications. Oscar Horta provides more reasons to favor antispeciesist advocacy in a talk entitled “About Strategies”.